Two key features of inflatables are that they can be easily transported and they're quick to set up. Within minutes after arrival, the hat was upright and visible to millions of people. According to Marketing Manager Cory Trotter, "The MONOPOLY MILLIONAIRES' CLUB™ Inflatable Hat helped support the launch of the MONOPOLY MILLIONAIRES' CLUB™ game at the North Carolina State Fair. 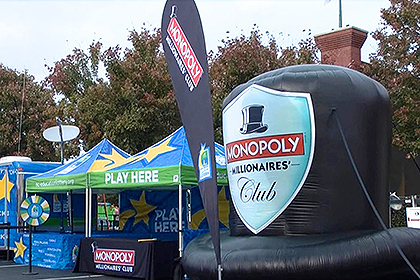 The overall on-site marketing strategy, including the presence of the inflatable hat, resulted in 20% of on-site sales from MONOPOLY MILLIONAIRES' CLUB™ tickets." The combination of a long-time favorite game, a wildly popular location and a highly visible inflatable made this event marketing project a huge success.